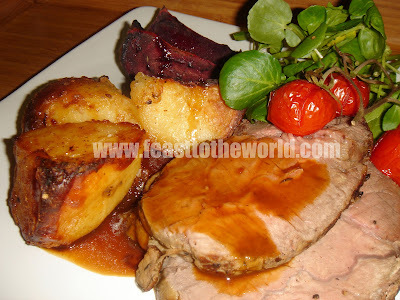 Sunday roast is one of those dish that evokes pang of emotions and memories for us all. It reminds us of our childhood, sitting by the dining table with the whole family, greeted by this magnificent feast, be it beef, lamb, pork or chicken every sunday afternoon. This is one great tradition and I think the most wonderful dish that the british has contributed to the culinary world. When at it's best, you are confronted with the tender, succulent joint served alongside with the light, crispy Yorkshire pudding; crunchy roast potatoes and the sweet, robust gravy which is just the most satisfying meal the one could ever dream of. Now there were also the downside, the dreaded boiled vegetables that looming throughout, cooked within an inch of their lives and sometimes beyond any recognition. The mushy, gloopy mess, it was that bad that sometimes, it was hard to distinguished if a mouthful of carrot or broccoli had just sneaked into your mouth. But still, we are always consoled by the luscious roast that will somehow save us from the travesty of the overcooked vegetables. And for just that perfect taste of the succulent meat, we will tolerate this barbaric act to the vegetables. All hail to the King of Sunday Roast! Heat the olive oil in a large frying pan over high heat. 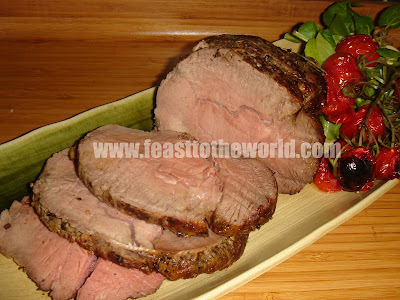 Season the beef well with salt and pepper, seared the beef and brown on all sides to lock in all the flavours. Remove and set aside. 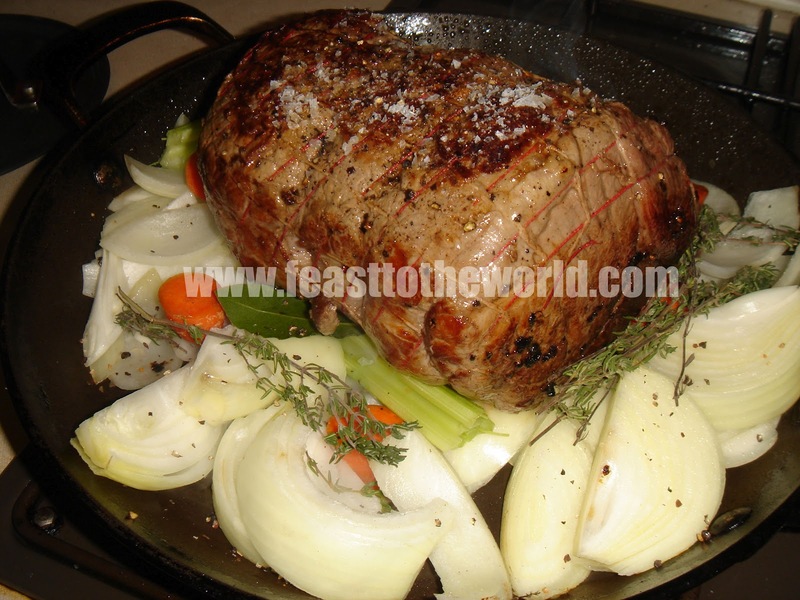 Pile all the vegetables, garlic and herbs in a large roasting tin with and lay the beef on the bed of vegetables. 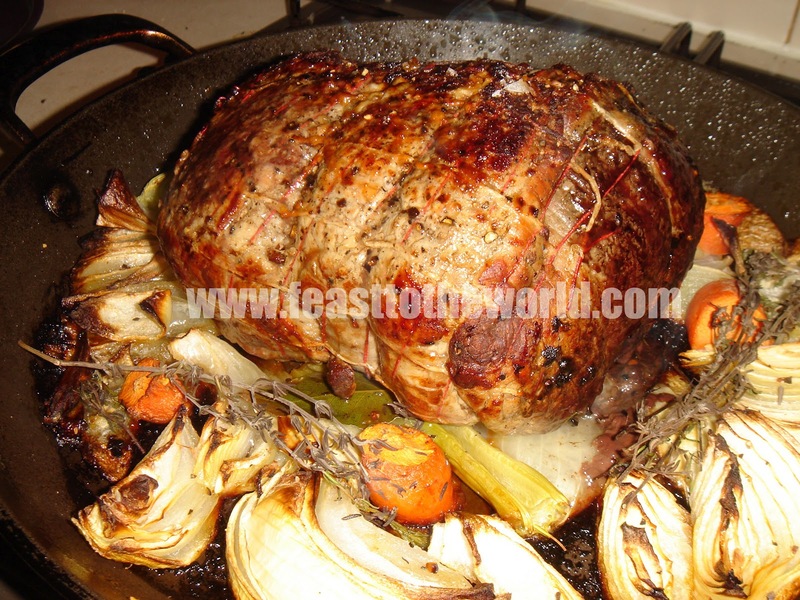 Add the butter and roast in the oven for 10 minutes, the lower the temperature to 200°C and roast for a further 25 minutes for medium rare. Take it out 10 minutes before for rare or give it another 15 minutes for well done. Once the joint is cooked to your liking, remove from heat and wrap the beef loosely in a aluminium foil and rest for at least 45-60 minutes. 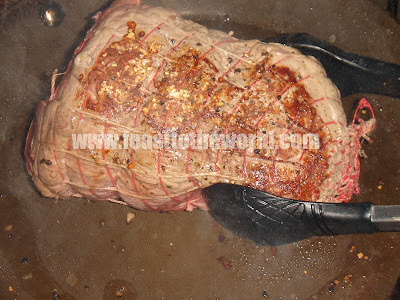 This resting process will allow the meat to relax, resulting in a tender and juicy meat. (This is also a good time to get on with the roast potatoes, Yorkshire puddings and any other trimmings that you are planning to serve with it). While the joint is resting, prepare the gravy. Heat the tin with the now browned vegetables on a stove over a medium heat. 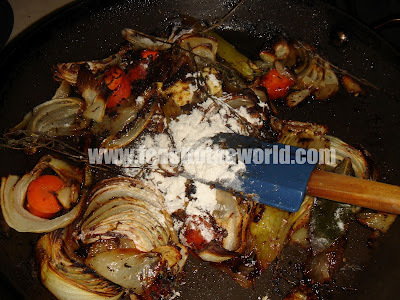 Add the flour and cooked for 2 minutes. Pour in the glass of wine to deglazed the tin and allow the wine to reduce to half. 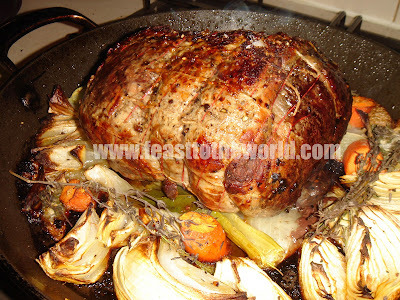 Add the beef stock, along with the redcurrant jelly if using and return to the simmer. 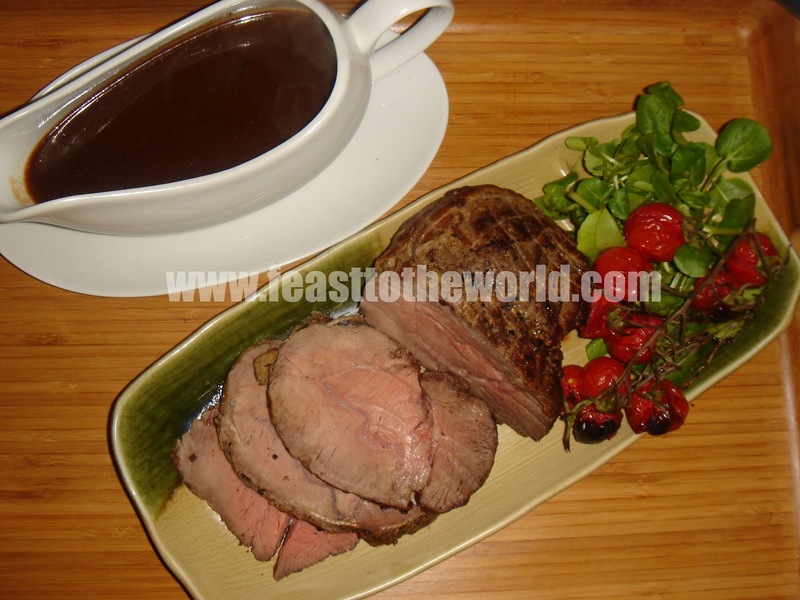 Any juices from the resting beef can also be added to the gravy at this point. Cook for 10 minutes, until the gravy has reduced and thicken before pushing through a sieve to extract any juices from the vegetables. 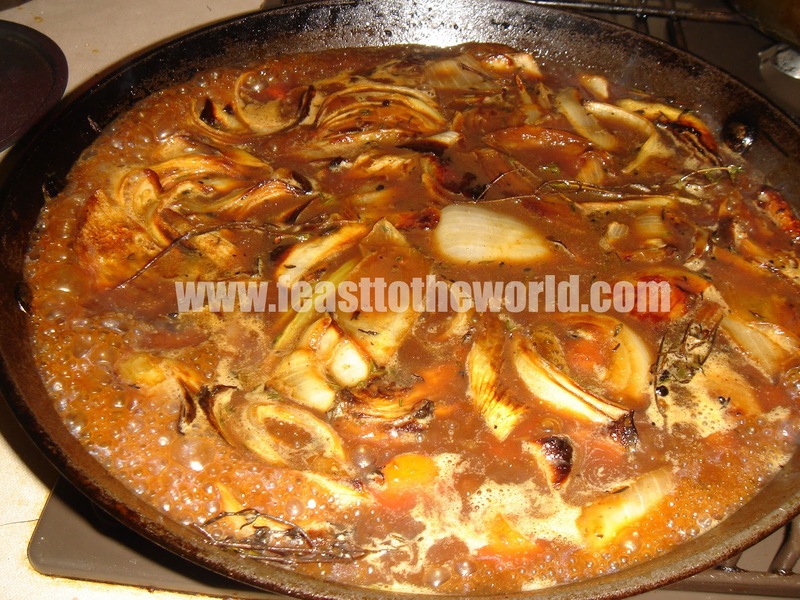 Season with salt and pepper to taste and the gravy is now ready. 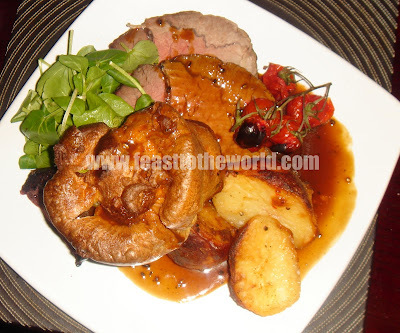 Serve the beef, thinly carved, with the gravy along with some Yorkshire puddings and roast potatoes.